Receiving a download from heaven in the spiritual realm is just like receiving one on your computer in the natural realm. You can run your connection on analog, dial up, broadband basic or high speed- but you must contain the right amount of megahertz to support the dimensions of the data. Some revelations that God is longing to reveal to you are held back and it is not because God is not speaking. Sometimes He is speaking very readily, but yet our internet connection is off, slow or interrupted. God always wants to reveal more of His heart in a relationship with us. Building up our faith through His word strengthens the signal of our Wifi connection. He has divine downloads for you which have the instant ability to activate applications you can’t even imagine! Your manifestations in the natural are in proportion to your faith. Scrolls are a re-occurring object in the Bible, and are often related to encounters in the supernatural or a divine act in which God conducts. 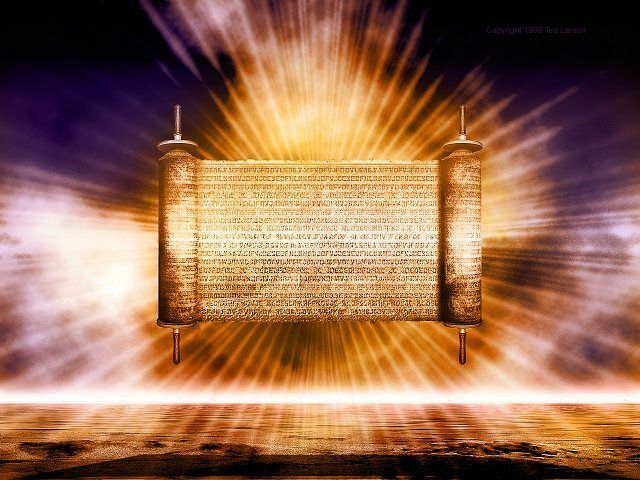 Scrolls also demonstrate God revealing His will and intentions before He does something in the Earth or in the Heavens. God does not do anything on the earth without a witness. In the book of Revelations, chapter 5, a scroll is described and was one in which no one was worthy to open on Earth. In the book of Isaiah chapter 34 verse 4, we learn that the heavens will be rolled up like a scroll; at the fulfilling of time. Again in Revelations 5 we see that the sky will recede as a scroll and every mountain and island will be removed. Ezekiel was told to eat a scroll by God, before he set out to prophesy. There is one element in scripture in the book of Zechariah where God presents Zechariah with a set of questions through a divine download. This Zechariah we are speaking about now is the “minor” prophet, who is recorded to be different from the priest Zachariah, who was the father of John the Baptist. His description of receiving a revelation from God and acknowledging the dimensions are paramount. Note: When God speaks, He is a gentleman. The Holy Spirit wants you to demonstrate your faith and will not force you into a dimension that you cannot handle. Note: There was no right or wrong answer here. You will “see” in the spirit, in proportion to your faith. Zechariah was demonstrating the capacity of his faith and acknowledging the weight of the revelation he was currently downloading. What he saw: A flying scroll. Many people use the word “dimension” loosely in church. But dimensions are very relevant in the language of God and not just some fluffy word. When you can recognize the dimensions of a divine revelation from God, you have activated the full capacity to contain, process and deploy that revelation. If I pull out an old computer from 1992 and try to connect is to my high speed Wifi connection, it is not going to have the ability to connect. The megahertz do not contain broad enough dimensions to process that connection. We have to renew our minds just as we need to update our computers. We need to ask God for a clean heart and contrite spirit just as we get new technology over time. If we do not have the right amount of mental and spiritual megahertz we can miss the message of God in the dimension of time. There is a time and season for everything, and all things have their appointed time (Ecclesiastes 3). Something cannot deploy before it’s appointed time, and even if it is deployed prematurely it will freeze up, halt and crash the operating system. God is saying to us all to get rid of the sensationalism, get rid of the feel good messages, cast down the entertainment, and eliminate the desire for deep sayings and slogans as shortcuts to a revelation. He is searching the hearts to see who is ready for downloads of revelation in which are assigned to this time and this season. Its time to be proactive in a revelatory capacity. Let’s increase our discipline of faith so we can hear what God is saying deeply and simply avoid the pit of feeling ministry is just BAU (business as usual).